Enjoy this traditional British tea. A selected blend of Assam, Kenyan and Ceylon tea provides a balanced and stronger full-bodied tea with an elegant flavor. It is a pleasant cup with or without milk. 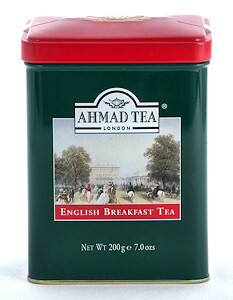 Ahmad Tea English Breakfast loose tea comes in a tin which depicts a charming British scene. 7.05 oz. Packed in England.